In a recent interview, game creator Tetsuya Nomura revealed that Kingdom Hearts III is now being developed on Unreal Engine 4. Oh. Alright, then. It was largely assumed that Square Enix was using an in-house game engine for Kingdom Hearts III like it is for Final Fantasy XV. That would make sense, no? The Unreal Engine 4, of course, is developed by Epic Games. Square Enix has used the engine's earlier iteration in the past, such as for The Last Remnant. Square Enix Europe also uses the Unreal Engine. Talking with Famitsu, Nomura explained, "Development is steadily proceeding as planned. Due to the impact of changing the game engine to Unreal Engine 4, which we did for various reasons, there is some difficulty rendering images. And with the full support of Epic Games, we'll be able to progress smoothly." The Unreal Engine 4, though, does look fantastic (here, here, and here). So hey, whatever helps them get this game out the door. Eventually. Go for it. 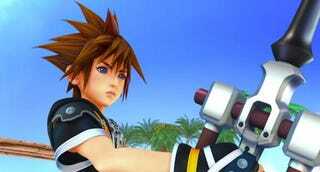 For more from Nomura about Kingdom Hearts III, be sure to check Kotaku's previous coverage. So, wait: What’s going on with all these Jokers?